While not every accident is avoidable, it is a shame to think that any severe injuries could have been avoided with a little forethought on someone else’s part. When it comes to public spaces or commonly frequented property, adequate care should be taken in order to prevent accidents to passersby. This is especially true of heavily trafficked sidewalks, which can easily lead to falls if left damaged or uneven for too long. 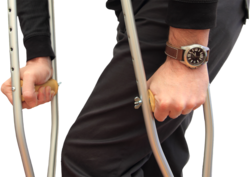 In the event you are significantly injured from a neglected sidewalk, you may be entitled to compensation from the property owner via premises liability. This can be a huge boon to victims who would otherwise be burdened with the financial aftermath of a severe injury. To help you better understand this risk and what can be done in response, our Torrance legal office provides the following information. How Can Sidewalks Be Dangerous? Each of these conditions may warrant a premises liability suit if the condition is not addressed in a timely manner, causing one to injure him or herself. A fall isn’t just an embarrassing accident - it’s one of the leading causes of injury among Americans. In fact, between 20 and 30 percent of reported falls result in significant injuries, including head trauma, fractures, and lacerations. Moreover, the expenses resulting from such an accident can have a lasting effect on one’s personal and professional life. Victims may have to pay for immediate medical bills such as ambulance use, ER visits, surgeries, and visits to the doctor. Injuries may also result in temporary or permanent lack of work, thereby impacting one’s source of income. Ongoing expenses may also include physical therapy and pain medication, and any death that results from a fall is that much more damaging to family and loved ones. Generally, the owner of a property is responsible for any injuries that occur as a result of inadequate maintenance or dangerous conditions therein. Although the nature of the accident and injury is important to determining fault, there is a strong case to be made against any owner who fails to maintain reasonably safe conditions of a sidewalk that is consistently used by the general public. Depending on where the accident occurred, the owner may be a person or business, or responsibility may fall upon the city’s Public Works department. If you have been injured due to a cracked or uneven sidewalk, contact an experienced personal injury attorney to begin examining your case. By gathering evidence of your accident and assessing the conditions of the sidewalk, we will help you determine whether the owner can be held liable. A premises liability suit aims to prove that severe injuries were caused as a direct result of a property’s conditions, which were allowed to exist as a result of the owner’s negligence. To help with the case, try and keep as many documents of the accident as possible: take photographs of your injuries and the sidewalk, save your medical records, record what happened throughout the accident, and save any correspondence you’ve had with the property owner. The more information that is readily available, the better your case can be represented. Our legal office is ready to hear from you regarding your accident, and to help you gain compensation for your injuries. Contact us to speak with one of our personal injury attorneys and learn whether you have a case.